You read right. A vegan caesar salad recipe with gluten-free croutons? It’s true! 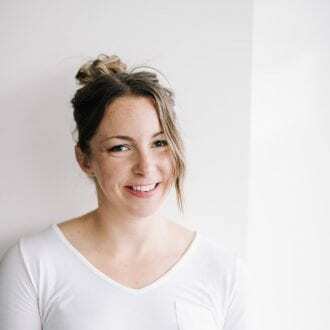 As I delved deeper into plant-based eating a few years ago, Oh She Glows was one of the first places I landed that helped me get started in the kitchen. I think most of you reading this today are probably familiar with Angela’s blog, if not a regular visitor to her site. Angela has long been a blogging hero of mine. She has built an incredibly dedicated following and I know she’s inspired many people to eat a healthier diet, whether they’re vegan or not. She is undoubtedly one of the most popular food bloggers out there. Her lovely and genuine personality shines through with every post, and her recipes are simple, wholesome and always delicious. I have made countless recipes from the Oh She Glows blog and in the past few weeks I started making a dent on the wonderful recipes from the Oh She Glows Cookbook. This is the kind of cookbook you can actually want to sit down and read, I even had it on my bedside table for a few nights, browsing (drooling) over the recipes I wanted to make. Just leafing through the book, I wanted to bust out my blender, preheat the oven, prepare the cutting board and get started. Upon first look, the Out-The-Door Chia Power Doughnuts caught my eye, as did the Taco Fiesta Potato Crisps, the Soul-Soothing African Peanut Stew and the Salt & Vinegar Roasted Chickpeas. Don’t even get me started on the snacks and desserts. This girl knows how to write a recipe, and name it, and photograph it, and make you want to make it asap. So far I’ve made the Creamy Avocado-Potato Salad, which my husband has asked for again every night since. I’ve also made the Long Weekend Grilled Salad, the Out-The-Door Chia Doughnuts, the Chocolate Oil-Free Zucchini Muffins and a few of the other salads. All have been excellent. 1. Over 100+ vegan recipes from smoothies, to salads, breakfasts, entrees, staples, desserts and more. 1. Beautiful and mouth-watering photographs of almost every single recipe. 2. Info on stocking a natural foods pantry. 3. Info on kitchen tools and equipment. 4. Personal words from Angela with every recipe and chapter. 5. Recipe made with simple, whole food ingredients. No crazy, hard to find items or imitation processed foods. 6. Includes revamped classics that meat-eaters will love. 7. Suits many dietary needs. Each recipe states whether it’s gluten-free,soy-free, grain-free, nut-free, oil-free and/ no-bake or raw. Along with my review, I’m so excited to share one of the recipes from the book here with you today. I decided to go with the Chakra Caesar Salad with Nutty Herb Croutons. My husband loves ceasar salad and I often make a vegan caesar salad with tofu in the dressing and homemade croutons made from sprouted-grain bread. With my husband currently eating paleo, that beloved recipe hasn’t recently been a staple at my house. Trifecta: Paleo, Vegan & Gluten-Free! As I was browsing Oh She Glows, the vegan caesar salad recipe caught my eye. Wait, no tofu in the dressing? Oh my god, the croutons aren’t made from bread!? It’s a caesar salad miracle! The croutons are absolutely genius! They’re so easy to make and so yummy! Amazingly, the whole salad is soy-free, grain-free, gluten-free and sugar-free. I die. And I get to share it with you today! Thank you, Angela! Cut off the top of the garlic head so all of the raw cloves are exposed. Remove any loose skin. Wrap the head in foil and place it on a baking sheet. Roast the garlic for 35 to 40 minutes, or until the cloves are soft and golden. Let cool for 10 to 15 minutes, until cool enough to handle. Remove the foil and squeeze the garlic cloves out of their skins and into a food processor. Add the soaked almonds, oil, lemon juice, Dijon mustard, salt, dry mustard, pepper, and ¼ cup water to the food processor and process until smooth, stopping to scrape down the bowl as needed. Taste and add more salt and pepper as needed. Add the minced raw garlic if you’d like the dressing to have a more intense garlic flavor – otherwise, leave it out. Place the lettuce in a large salad bowl and pour your desired amount of dressing on top. Toss until fully coated. Sprinkle the Nutty Herb Croutons over the salad just before serving. From The Oh She Glows Cookbook: Vegan Recipes to Glow from the Inside Out by Angela Liddon. Copyright © Angela Liddon, 2014. Reprinted by permission of Penguin Canada Books Inc.
Preheat the oven to 300 degrees F (150 degrees C). Line a large rimmed baking sheet with parchment paper. In a small bowl, combine the flaxseed, oil, and 2 tablespoons water and stir. Set aside for 5 minutes, stirring occasionally, until the mixture has thickened. In a food processor, pulse the garlic to mince it. Add the almonds and process until finely chopped. Add the onion, parsley, basil, thyme, rosemary, oregano, salt, and flaxseed mixture and process until a sticky ball of dough forms. With your fingers, sprinkle small portions of the crouton dough onto the prepared baking sheet, using roughly ½ teaspoon of dough per crouton. Place the croutons 1 inch apart on the baking sheet and sprinkle with Herbamare. Bake for 20 minutes, then gently flip the croutons and bake for 10-15 minutes more, until golden. Watch the croutons closely near the end of the baking time to make sure they don’t burn. Let the croutons cool on the pan for 10 minutes. They will firm up while cooling. Cool the croutons completely and store in an airtight glass jar for 2 to 4 weeks. Disclaimer: I was provided a free copy of The Oh She Glows Cookbook in order to write this review. I was not compensated otherwise, all opinions are my own. I will buy the cookbook if I don’t win – I love making Angela’s recipes! I want a copy of this cookbook because I love the focus on real whole foods! It is such a great way to nourish the body! I would love to win this cookbook! I have been eyeing all the pictures and recipe creations everyone has been posting on social media. If I don’t win this contest I will definitely be purchasing the book in the very near future 🙂 thanks for sharing the recipe, Deryn! I can’t wait to make it!! I love Angela! She is so sweet and was one of the first food bloggers I started following! Great book. So inspired to eat healthy, vegan, and expand my repertoire in cooking and diets. I’m a college student who’s going to become an RD. I love cooking and baking and would love a great cookbook of nutritious eats! I would love to learn some new recipes and have a reference for when I go to college in the fall! I pinned one of Angela’s recipes just moments before reading your post…what a coincidence! I love Oh She Glows and have heard nothing but praise about this cookbook so far! I keep entering giveaways to win it, but I’ll have to buy it soon if I don’t win. 🙂 don’t think I can hold out much longer. I would like this cookbook because I’ve been reading Angela’s blog for a while now and her recipes are always amazing! I’ve been following Angela’s blog for years now, and I love her recipes! Can’t wait to get my hands on this cookbook. I love ALL of Angela’s recipes! I make one at least once a week and every Sunday make her make ahead oatmeal. She is such an inspirational and I love seeing her all over the blogosphere for this awesome accomplishment! I would love to learn some new vegan recipes… Angela is so talented! I’d like to win because I’ve always loved every recipe from Oh She Glows and would like to make more! I LOVE Angela’s cookbook! I LOVE the enchiladas, I’ve already made them twice and I plan on making them again soon!! I want to win because I’ve succeeded in making my family eat vegan dishes as a result of using those posted on ohsheglows, so I would love to have the cookbook as well! I wanna try all the wonderful vegan recipes! I want this cookbook, whether I win it or have to buy it! looks like an awesome cookbook. can’t wait to try the caesar salad! I love her recipes. I make her overnight oats all the time. Would love to win the cookbook so I can find more favorite recipes! I’d LOVEEE to win her cookbook! I’ve heard soooooo many good things about it and from what I’ve seen and read from reviews, the food/recipes look soo delicious! I’ve been following Angela’s blog for a few years now and I just love her recipes! They are always sooo delicious and healthy. I want to learn some new and healthy meals! I’ve been seeing people all over rave about this, hope i win! Angela is fantastic, and I often make her recipes, they are so full of wonderful whole food ingredients! This salad looks SO good, I have been looking for a revamped Caesar! Oh She Glows won my family over years ago with her Mint Cocoa Spelt Cookies. Her site has been my go-to ever since. I’d love to have her cookbook in my kitchen!